Just two weeks after Jim Clark gave the Lotus-DFV 49 victory on its debut in Holland, the F1 teams gathered at Spa. The field was much as normal and it was no real surprise to see Clark on pole by three seconds. 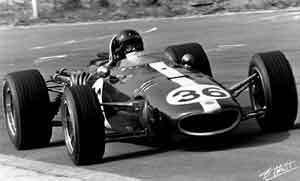 Dan Gurney - fresh from his victory the previous weekend for Ford in the Le Mans 24 Hours - did well in the revised Eagle-Weslake and was second with Graham Hill third in the second Lotus. Jochen Rindt's Cooper-Maserati was on the second row with Chris Amon's Ferrari while the third row featured Jackie Stewart in the BRM H16, Jack Brabham's Brabham-Repco and Mike Parkes (who had finished second at Le Mans sharing his car with Lodovico Scarfiotti) in the second Ferrari. Behind them came Scarfiotti in the third Ferrari and John Surtees in the Honda. Denny Hulme was a long way back in his Brabham-Repco unhappy with the handling of his car. While Clark took the lead at the start, Hill failed to make the start because of a flat battery and had to set off from the pits a long way behind. Gurney tried to make the start without putting his car in gear and so second place went to Rindt with Stewart and Parkes giving chase. Towards the end of the first lap Parkes slid on some oil from the BRM and crashed at 150mph in the Blanchimont corner. He survived but suffered serious leg injuries, a broken wrist and a head injury which ended his F1 career although he remained on the staff at Ferrari for many years as a test driver and engineer. Rindt faded in the early laps and that left Stewart to chase after Clark with Amon moving up to third although he was soon pushed back by Gurney who then chased after Stewart. At the end of lap 12 both Clark and Gurney pitted. Clark had his plugs changed and rejoined in seventh place while Gurney told the pit that his fuel pressure was low but rejoined without stopping. He remained in second place but had dropped 15 seconds behind Stewart. Stewart would run into gear-selection problems later and had to drive one-handed, using the other to hold the gear lever in place. On lap 21 Gurney took the lead and he went on to win by over a minute. It would be Eagle's one and only Grand Prix victory. Stewart finished second with Amon third.